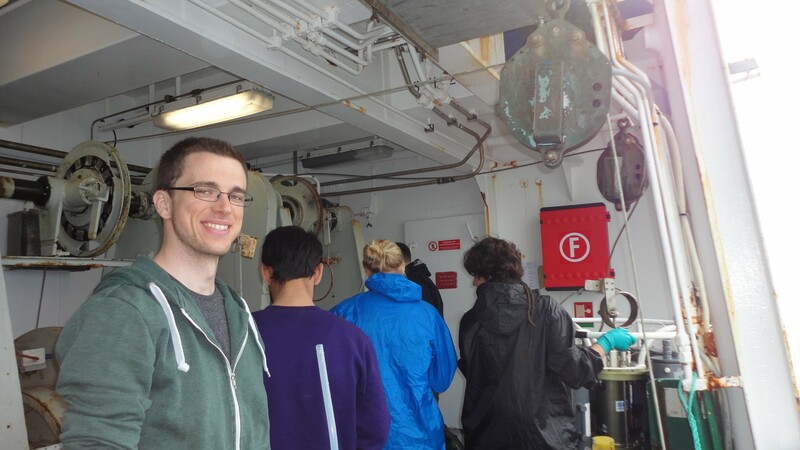 <h2>Sample labelling in the North Sea helping link up Europe’s research ships</h2><br /><p>‘If you take water samples and you freeze them, you put them in the freezer, how do you label them?’ said PhD student Wünsch after his training trip aboard the Danish research ship Dana. ‘We had the experience that labels would come off.’</p> <p>It’s the kind of valuable lesson that researchers can only get out in the field, and it’s knowledge that Wünsch will take with him when he goes on a real research voyage next year.</p> <p>Research vessels, often hardy ships that include icebreaking hulls and stores for long and difficult voyages, allow scientists to travel the world to check on things like polar ice caps, ocean currents and coral reefs.</p> <p>Countries often run dozens of research ships, but some are better known than others. One of Europe’s most famous is the German ship Polarstern, which in 1991 became the first conventionally powered vessel to reach the North Pole.</p> <p><img src="/sites/default/files/1200px-Polarstern_awi_hg.jpg" alt="The German ship Polarstern hosts international research expeditions to the Arctic and Antarctica. Image credit: 'Polarstern awi hg' by Hannes Grobe, Alfred Wegener Institute is licensed under CC BY-SA 2.5" title="The German ship Polarstern hosts international research expeditions to the Arctic and Antarctica. Image credit: 'Polarstern awi hg' by Hannes Grobe, Alfred Wegener Institute is licensed under CC BY-SA 2.5" width="1200" height="570" class="@aligncenter@" /></p> <p>The problem is that many of these ships carry out their work separately, meaning that there is scope for duplication and inefficiency.</p> <p>Wünsch had been a student on the floating university as part of an initiative run by the EU-funded EUROFLEETS2 programme.</p> <p>‘It helped me a lot, because I was actually going on a research cruise the next year. Then, I felt well-prepared for that cruise,’ said the 30-year-old chemical oceanographer.</p> <p><strong>Transferable</strong></p> <p>These floating universities are extremely useful as the skills are transferable – meaning that on later research cruises, Wünsch was able to hit the ground running.</p> <p>‘The central point of every research cruise – salinity, temperature, water column – they have been the same on cruises I went on afterwards.’</p> <p>Associate Professor Colin Stedmon of the Technical University of Denmark organised the course as part of the EUROFLEETS2 project, which is trying to coordinate the work of research vessels across Europe and has funded 23 cruises and over 300 scientists at sea.</p> <p>‘Some students learn it all from books, but some students really learn a lot from being exposed to what they're learning at the same time, and more hands-on experience,’ he said.<br /> <div class="quote-view quotesBlock quote_horizontal"> <div class="quotesTop"><img src="https://horizon-magazine.eu/sites/all/themes/horizon/images/quotes_top.png" alt="" title="" /></div> <p>‘The central point of every research cruise – salinity, temperature, water column – they have been the same on cruises I went on afterwards.’</p> <blockquote><p>Urban Wünsch, PhD student, Technical University of Denmark</p></blockquote> <div class="quotesBottom"><img src="https://horizon-magazine.eu/sites/all/themes/horizon/images/quotes_bottom.png" alt="" title="" /></div> </div> </p> <p>Through initiatives like the floating university, the EUROFLEETS2 project is helping to standardise the way research scientists work. It is also working on shared robots for global marine exploration and harmonising data collection methodologies throughout the world.</p> <p>It means that, for the first time, scientists from any EU country can take the role of scientific cruise leader, following a peer review selection procedure. In addition, it is now easier for scientists to pool access to research vessels more efficiently.</p> <p>‘Oceans are worldwide, ocean research has a strong&nbsp;international networking character, so oceanographic fleets should tend towards international coordination amongst partnering countries,’ said Dr Jan Opderbeck, from the French Research Institute for Exploitation of the Sea, who works on EUROFLEETS2.</p> <p>‘Sharing data freely is essential,’ added Professor Martin Visbeck from the GEOMAR Helmholtz Centre for Ocean Research Kiel and Kiel University in Germany.</p> <p><a href="http://bit.ly/newsalertsignup" target="_blank"><img src="/sites/default/files/news-alert-final.jpg" width="983" height="222" /></a></p> <p>He coordinates the EU-funded ATLANTOS project to revolutionise ocean observation science by moving from the currently fragmented system, which sees different research fleets collecting their data in sometimes uncoordinated and often non-harmonised ways, to a more integrated and fit-for-purpose system.</p> <p>The project is contributing to the&nbsp;<a href="http://ec.europa.eu/research/iscp/index.cfm?pg=transatlantic-alliance" target="_blank">Transatlantic Ocean Research Alliance</a>, a research collaboration between the EU, Canada and the US to better understand the Atlantic Ocean.</p> <p>‘If we (as marine scientists) weren't open about sharing our data, we would have a very hard time in making safety and navigation forecasting like waves, currents and oil spills; and assessing climate change, how the oceans are warming, how ocean acidification works.’&nbsp;</p> <p><em>If you liked this article, please consider sharing it on social media.&nbsp;</em></p> <br /> <img src=”http://www.google-analytics.com/collect?v=1&tid=UA-40077089-1&cid=sample-labelling-in-the-north-sea-helping-link-up-europe’s-research-ships&t=event&ec=republish&ea=read&el=sample-labelling-in-the-north-sea-helping-link-up-europe’s-research-ships&cs=republish&cm=republish&cn=republish&cm1=1" /> This post <a href="https://horizon-magazine.eu/article/sample-labelling-north-sea-helping-link-europe-s-research-ships.html">Sample labelling in the North Sea helping link up Europe’s research ships</a> was originally published on <a href="https://horizon-magazine.eu/">Horizon: the EU Research &amp; Innovation magazine | European Commission</a>. Urban Wünsch never expected product labelling to be the hardest part of a seven-day voyage across the North Sea. It’s the kind of valuable lesson that researchers can only get out in the field, and it’s knowledge that Wünsch will take with him when he goes on a real research voyage next year. Research vessels, often hardy ships that include icebreaking hulls and stores for long and difficult voyages, allow scientists to travel the world to check on things like polar ice caps, ocean currents and coral reefs. Countries often run dozens of research ships, but some are better known than others. One of Europe’s most famous is the German ship Polarstern, which in 1991 became the first conventionally powered vessel to reach the North Pole. The problem is that many of these ships carry out their work separately, meaning that there is scope for duplication and inefficiency. Wünsch had been a student on the floating university as part of an initiative run by the EU-funded EUROFLEETS2 programme. ‘It helped me a lot, because I was actually going on a research cruise the next year. Then, I felt well-prepared for that cruise,’ said the 30-year-old chemical oceanographer. These floating universities are extremely useful as the skills are transferable – meaning that on later research cruises, Wünsch was able to hit the ground running. Associate Professor Colin Stedmon of the Technical University of Denmark organised the course as part of the EUROFLEETS2 project, which is trying to coordinate the work of research vessels across Europe and has funded 23 cruises and over 300 scientists at sea. ‘Some students learn it all from books, but some students really learn a lot from being exposed to what they're learning at the same time, and more hands-on experience,’ he said. Through initiatives like the floating university, the EUROFLEETS2 project is helping to standardise the way research scientists work. It is also working on shared robots for global marine exploration and harmonising data collection methodologies throughout the world. It means that, for the first time, scientists from any EU country can take the role of scientific cruise leader, following a peer review selection procedure. In addition, it is now easier for scientists to pool access to research vessels more efficiently. ‘Oceans are worldwide, ocean research has a strong international networking character, so oceanographic fleets should tend towards international coordination amongst partnering countries,’ said Dr Jan Opderbeck, from the French Research Institute for Exploitation of the Sea, who works on EUROFLEETS2. ‘Sharing data freely is essential,’ added Professor Martin Visbeck from the GEOMAR Helmholtz Centre for Ocean Research Kiel and Kiel University in Germany. He coordinates the EU-funded ATLANTOS project to revolutionise ocean observation science by moving from the currently fragmented system, which sees different research fleets collecting their data in sometimes uncoordinated and often non-harmonised ways, to a more integrated and fit-for-purpose system. The project is contributing to the Transatlantic Ocean Research Alliance, a research collaboration between the EU, Canada and the US to better understand the Atlantic Ocean.